Peter Pan Comes to Inly! 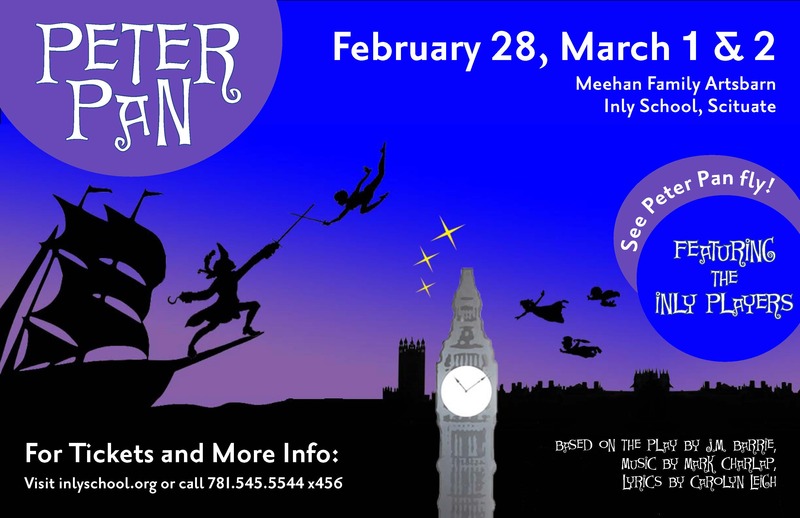 Peter Pan is coming to Inly! Set to open on February 28, this year’s Inly Players performance promises magic, joy, and a consciousness that brings to life the heart of the Neverland tale. Amy Martell, mother of Inly Students Lilja (’19) and Theo (’22) and cast member in the play sat down with the director, Martha Sawyer, to discuss this year’s production. Amy: So, given all of the other wonderful possible musicals out there, why Peter Pan? What made you want to put on this production at Inly? Martha: Well, at Inly, one of the things we have to consider is [choosing] a show that will showcase not only the great student aspects but also the aspects of the adults that we can bring into a cast. The show also has to have an appeal…we specifically look for a show that will have a lot of imagination in it, something that will appeal to a young demographic—not just from a performance standpoint, but [also] from an attendance standpoint, and we want to have themes that we feel the students will learn and grow from. Inly did Peter Pan as the premier show for the Artsbarn and we had considered it again for last year’s play. However, we wanted to make sure that all of the students who had done it before had already gone through the school so that it would be a new experience for the students and no one was going to do the same show within their tenure as an Inly Player. I’ve never done the show—so I’m very excited! I love doing a show for the first time! It’s amazing that in your whole career you haven’t done the show! What are some of the technical challenges of the show? Well, number one, you’ve got flying. It’s interesting, they’ve just come out with a junior version of this show from one of the houses where they have suggestions for doing a show where you don’t have to fly, which would work beautifully, but there’s nothing quite like Peter’s first entrance…it’s magical. It’s one of those moments in theater that just…happens. That’s one of the great technical aspects. The other thing is that, because of the setup of the barn, everything is done sort of in the round, so I’m constantly trying to make sure that the vision, and the way we tell the story appeals to all sides of the audience so they will get an equal experience. So you have to really work with your actors to make sure that they’re not getting stuck in a proscenium, downstage presentation. We have to really work on staging and using every side and crevice of the barn and the space. So that’s fun, but it can be challenging too. So that brings me to my next question. Many people have seen other productions of Peter Pan, including the Mary Martin version, the Cathy Rigby version, the Disney version, and even the Inly version in 2007. Can you share with us a little bit of your vision for this production? Well, because this is the first time that I have done it, I read the script and I thought it was charming, I really did—I jumped right back into the lovely Victorian storytelling. But most of all I was struck by the definition of Neverland. When Peter sings the song, “Neverland,” he describes this place where “time is never planned,” and I think my brain just sort of latched onto that and said, “Ok, there’s my theme.” For me, it’s so childlike. It so captures the essence of who Peter is, and why he holds on to that mystery of Neverland through so much. When I worked with actors the other day, we talked a little bit about, ‘what would a place where time is never planned be like?’ and one of them said, “It would be chaotic!” And you know, I said, “that’s because we come from a world where, for instance, the first thing I did at rehearsal is give out a schedule. We are planning every second.” And I said, “You’re right! It might be chaos. But it could be good chaos—it could be bad chaos. It would be different.” So that’s probably the main theme that I asked all the designers and the creative team to keep in mind as we make the journey through the rehearsals. I want the wonder of Neverland—this place where the joy and the freedom of youth to sort of just take a day and let it happen—can be captured. So that’s what we are trying to envision. You gave me goosebumps in rehearsal the other day when you described it! It really sounds magical. So, another important question—J.M. Barrie wrote “Peter Pan, or The Boy Who Wouldn’t Grow Up” in the early 1900s, and the first production of that play was produced in 1904. The story takes place in Victorian England and is clearly rooted in a Victorian mindset, such as in the characterization of the so-called “Indian” characters. How are you working with these aspects of the play? So, there are sensibilities. You encounter this with any piece—each piece is written in its own timeframe and with its own sensibilities of how life was at the time and how perceptions were at the time. This piece is based on a story written in the early 1900s, this stage play was done in the mid-1950s, so those sensibilities are part of the play. How people are imagined—whether Indians or Pirates, even the Lost Boys who are orphans who are basically described as children who have fallen out of prams—you know, these ideas are drawn from the time when the play was written and produced. Now, in 2014, our awareness is different, and we are aware of the importance of rejecting stereotypes about places and people. So what we have specifically tried to do is say, again, going back to that lyric in Neverland, we want to create a world where, yes, there are groups that may seem different to each other [initially], but they, in fact, build a bond through learning and through knowledge and through discovering—through the story of the play. We are going to make this a very strong theme (and I’ve already started in rehearsals with the students)—how the different characters start off being afraid of each other, and by the end of the show they are no longer afraid, they’ve learned to work together, and even to overcome some of the obstacles they face together, because they have learned about each other. We did an exercise this afternoon at the rehearsal where I asked students ‘what are the types of things that make you afraid?’ They talked about being in dark, they talked about sounds they weren’t sure of, and they talked about trying something new—those were all things that might be fearful. And then I asked, how do you deal with things that you are afraid or things that seem different to you? And they all gave me different solutions. Some said ‘oooh, I might run away.’ Some said ‘I might try to stay closer to it so that I learn more about it.’ Others had other solutions. What I’m trying to do when working with students in this way is to find the feelings of how you might have an unease about something that is different, but then through opening up and making the journey and learning about that person or that place or that thing you can learn to fit it into part of your story. So that’s what we’re working on. In addition, one thing we have also decided is that during production of the play we will continually refer to the ‘Neverland Lost Boys,’ the ‘Neverland Pirates,’ and the ‘Neverland Indians’ when talking about the different groups of characters. This is to emphasize to the children that these groups of people exist only in Neverland—they are imaginary, not based on any real people in our world. So, is there any one thing you are most looking forward to about this production? I know that’s a hard question! It’s not too hard! What I love about the Inly shows is that, when everything comes together, and the students and the adults—you know, you have professional actors working with students—when I see those two worlds connect—when I walk through the backstage before the shows and Scott [Wahle] will be sitting chatting with a third or fourth grader, and they’ll be speaking right up and giving him their impression of how the show went—those moments are what I thrive on, I love them. Martha Stewart is an award-winning director, actress and designer. She has previously directed OLIVER!, THE WIZARD OF OZ, BEAUTY AND THE BEAST, WILLY WONKA and THE MUSIC MAN at Inly School. Over the last three decades Martha has served as artistic director for more than 50 full stage productions in the community, scholastic and regional theatre venues. A graduate of Manhattanville College, Martha has studied directing with Helena Dreyfus of Yale Drama School and David Wheeler of Harvard and A.R.T. She has served as an adjudicator for the Mass. High School Drama Festival and has won awards from EMACT and AACT for outstanding direction, set and costume design for productions on the state and regional levels. She is a member of the Board of Directors for Curtain Call Theatre in Braintree and is on the staff for Theater Plus in Marshfield. Martha extends her sincere thanks to the whole Inly community for their hard work and support in bringing these wonderful productions to the stage. Next Post: What is Diversity at Inly and Why Does it Matter?